Item Code: LJ4P4C/100. Category: Plugs. RJ type plugs originated in North America and the RJ10 is the smallest version and used mostly on Telephone Handset cords and office headsets. 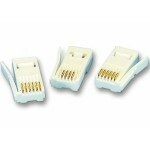 The next size up is the RJ11 which it can be mistaken for the RJ10 . The RJ10 only has 4 channels where the RJ11 has six and that’s how you can tell the difference.